Attendance figures for the first half of the 2014-15 Irish Premiership campaign have shown a significant increase on the previous season. According to Northern Ireland Football League statistics, the number of people attending games has risen by 12.9% compared to the same period last year. This is the equivalent of 109 more fans attending each Premiership fixture. Andrew Johnston, Managing Director of the league, said a number of factors had helped boost spectator numbers. "We knew the attendances had been on the increase this season, but as this statistic can vary from week to week we wanted to assess things at the midpoint of the season so we could get a clearer indication of the attendances over a prolonged period of time," said Johnston. "A 12.9% increase in attendances is phenomenal and is testament to the hard work each club continues to do off the pitch to attract fans through their gates each match day." With a cumulative total of 108,494 fans having made their way through the turnstiles since the opening day of the season in August, this represents an increase of almost 12,500 more supporters attending the 114 matches played to date. "Social Media is one area of communication that people now rely on for information and our clubs have really embraced this through their Twitter and Facebook activity. "Many clubs have also taken part in the trial to play more games on a Friday night and early indicators have shown that certain matches played at this time can improve attendances. "Perhaps the most important factor in the increase in attendances is the competitive nature of the league this season, with Cliftonville, Portadown, Linfield and Crusaders all within three points of each other at the top of the table. 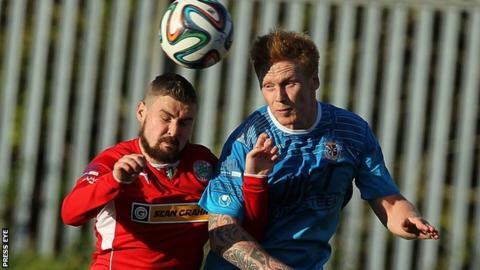 "In addition to these four clubs, Glenavon and Ballymena United have also been league leaders at various stages of the season," added Johnston.